May | 2015 | #Hope lives! BNY Mellon Cox’s newest simulation assumes Japan manages to average growth of 2 percent for the rest of this decade, the U.S. 3 percent, China 7 percent and India 8 percent. He says that if this Gang of 4 starts to fire on all four cylinders, then we could see another $ 10 Billion added to the group’s GDP by 2020. This is not an unrealistic scenario as the current leaders Abe, Obama, Xi and Modi are all pushing for better trade treaties and greater growth. In fact these targets may be exceeded if we can only keep war at bay, and not allow any economic shocks to develop. The banks and the largest corporations have survived the Great Recession, and have learnt a valuable lesson, and their balance sheets are stronger now. The consumer is more willing to spend, and create the demand, that growing industrial companies and service corporations will provide. There is an opening up of trade and commerce, and the next cycle of cheap manufacturing for the masses, is about to start in India. The newly created billions of consumers in Asia will become a driving force, and the young generations will develop the next smart cities, and mass transportation systems. In my optimistic view these numbers can be surpassed with cheaper fuel costs and greater use of Green energy to save the environment. There is so much demand for green housing, higher education, better skill training, improving healthcare, more geriatric care and improved logistics, that nation building can go on for decades. We just need to balance incomes so the poor can become self-sufficient, and productive citizens. Current disparity if it continues will lead to Larry Summers ‘secular stagnation’ and we will not benefit from a growing middle class. Greater opportunity and greater trade and commerce is the only way out of this morass of low growth. Financial inclusion for the poorest of the poor, is the cry of the hour. The time is now ripe as we have abundant resources and technology to take humanity, to the next level of existence. With a well-oiled economic engine, we can expect current growth; to create more savings and investments, in a virtuous spiral of growth. We are all in this together and if the stars align, then the new leaders will take the steps to create the right political and social environment, for this economic miracle to take place. I welcome all steps in the direction of human development and peace and prosperity for all. May the next decades be the time, for the emergence of this unlikely gang of four; to rise to their pinnacle. We look forward to finally eradicating poverty, and bringing human equality, prosperity, dignity and well being to all our citizens. 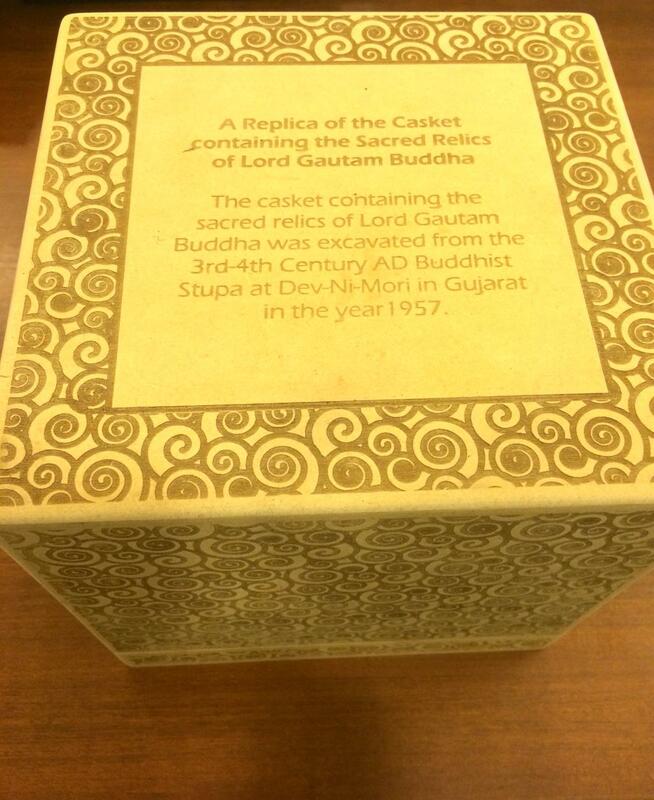 President Xi Jiping of China was just presented with the gift of the model casket that contained the sacred remnants of Gautam Buddha , by the Indian Prime Minister Mr. Narendra Modi, from a 3rd century stupa, in his home state of Gujrat. In the nature of global hegemony, this is a southern attack; on the minds and souls, of the north. The brilliance of this golden move, is something only ancient civilizations that count in millenniums, can truly understand. If peace were to reign between the nations of China, India and the erstwhile country of Tibet then a reintroduction of Buddhism is not a bad approach. In a communist nation, how can their be opposition of a religion; where there is no concept of God, Hell, Heaven or ritual worship. The middle path is anchored by its four noble truths of suffering, and the eight fold path to escape from this suffering. In India, Buddhism was largely absorbed into the main Hindu faith, and largely disappeared after a thousand years; but in neighboring countries, the faith lived on all over south east asia for a thousand more. My teacher came from Burma (Myanmar) and brought vipasyana meditation back to India and many practice it today. His Holiness the Dalai Lama is a living symbol of all the pure thinking and living in Buddhism. When one sees the temples in Sri Lanka one is struck by the simple faith of the island dwellers, and we feel the joy that these people live in. There are already Buddhist traditions and temples all over China and it is time now to try and revive them for the greater good of its people. As rampant growth was effected by the leadership, as China opened out to the world in the last few decades, something is still lacking. The pheasants who are still on the land live in a different zone but modern China has increasingly Industrialized. These modern cities with well over 10 million residents in many cases, have their citizens seeking more from life; now that their basic needs, have been fulfilled. They seek more from the meaning of life and its purpose, and seek a way to live in harmony with those around them. The average citizen needs to feel a higher calling, and to try and reach a better place in life, than just a humdrum existence of studying, working, retiring and dying. Faith is a great motivator and meditation can bring a calm and happiness, and allow us to improve ourselves, if we just put our minds to it. There is more to our existence and while we are creators of our own karma, Buddha showed a way of how we could escape from this world of Maya, and desire. His disciplined approach of right thought and action and other steps, showed a deep understanding of nature and how to live in harmony, with all of earth’s creatures. He showed a better way of life, and if followed he said, we could escape from the dharmachakra, and reach a state of Nirvana or holiness, where the suffering that afflicts mortals ends. Knowledge and awareness is the only way to destroy ignorance, which is the root of all suffering, as per the Great Buddha. Mr. Modi has not squandered away his priceless gift on fools, as there is something deeply symbolic in this giving. It is a hand offered in friendship and faith from one leader of an ancient land to another neighbor, recognizing their common heritage. Human thought and interaction has been progressing for millennium, and now the time has come to redeem some of its ancient promises.’ Hindi Chini bhai bhai’ was a slogan I heard from Chacha Nehru, before the border war in 60s. It may be time to dust off that old slogan, and try a common path for our development. For the sake of half of the world’s population such chances should not be squandered in petty quarreling, over ancient wounds. 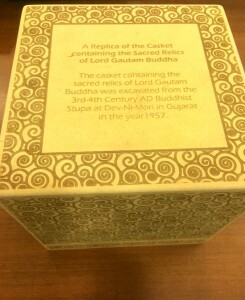 ‘Buddhism is more of a science of the mind than a religion’ as per the Dalai Lama. We need to use our minds to better our common human conditions, and as such any attachment to old thinking must be nirvaaned. We must now move forward recognizing our common heritage, and more importantly our common future, as fellow citizens of our world. Even more important than any economic agreements that we can make in this historic visit, will be the recognition of a commonality of our heritage, and a march to a shared future. 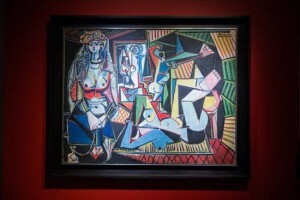 “Picasso’s 1955 oil painting, “The Women of Algiers (Version 0),” sold for $179,365,000 after more than 11 minutes of furious bidding from telephone buyers at a packed auction room at Christie’s. “ reported the Economic Times. In our modern times great wealth has become so anonymous, that it is hushed voices, heard over the conference telephone bidding on priceless works; to be preserved, for their private viewing. At no time has the contrast between the rich and poor been so great in our recent history and the have nots can only hope for a decent dinner before bed, if they get lucky. I love the painting, as it is truly remarkable how the vision of the artist; sees our world, in so many dimensions and colors. The women are so wonderfully posed in their leisure as they await life. Sensuality runs rampant and the imagination comes alive, to what they must be thinking, as they live their exotic ways. It is one of his best compositions, for that special period; when he surprised the world by taking his art, into a new way of representing the human figure. The interwoven geometric designs, blend together; in a riot of shapes and this three dimensional peeking, comes with great delight for the beholder of these beautiful women. Depth and perception have been mastered, and one can get lost into the heart of the piece; trying to find, its deeper meaning, from this wonderful artist, who lived life in its fullest measures in many ways. I am no art critic but the stupendous out pouring of serious money for these small canvas pieces runs into billions of dollar. This is at a time when billions are malnourished and hungry and art may be the last thing on their minds. 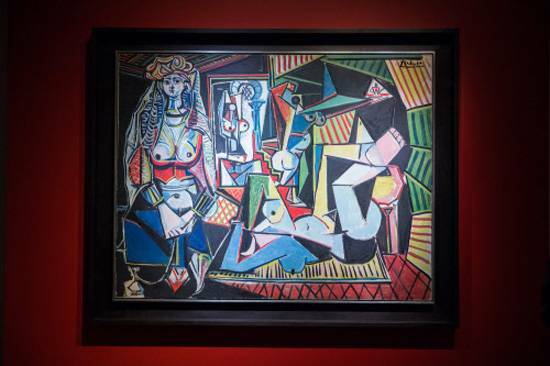 Prices are very strong right now as Christie’s auctioneer says that they cannot find enough masterpieces, to sell for the rich and famous. So it looks like the rich continue to get richer and the poor are not seeing the trickle down effect and in fact are being pushed further away from a civilized life. The ‘Women of Algiers’ is just an example of what is happening in our crazy world. Their juxtaposed body parts reflect our crazy world like no other, and we can see what the artist saw and painted. It is a mirror of our modern world where everything is now divided into the ones who live in luxury, and the ones who are driven to despair by their life.